Observation 2: From this table it is easy to see that most of the skills - Find/Remove Traps, Hide in Shadows, Move Silently, Pick Locks and Pick Pockets - are always within a band of 2 points of each other. Generally, they start at 16-18, improve 1 point per level, before accelerating to a rate of 2 points per level starting at 5th or 6th level. These could very easily be collapsed into one chance without losing much precision - let’s say into the middle chance, Pick Locks, a 17. One of the remaining two skills, Hear Noise is one that many tables including mine (and some retroclone rulesets) ignore, simply letting players succeed to listen if they spend a bit of time, so it can be ignored here. Climb Sheer Walls is a bit of a tricky one. It’s the only one that starts at a high chance of success, 87%, and improves by one percentage point per level, so it ill fits non-percentile models. However, there is precedent in the OSR of merging Climb into a more “unified” skill system, in LotFP, where Climb improves in steps of the same size as other skills. If Specialists put all their points at 1st level towards Climb, they end up with chances quite similar to the ones in B/X - good chances in climbing (5/6), terrible chances of doing anything else (1/6). Let’s assume that in our modern mindset we want a resolution mechanic that can be applied not just to Thieves, but all classes, while still retaining Thief superiority. Naturally, we achieve that by treating all other characters as zeroth level Thieves. 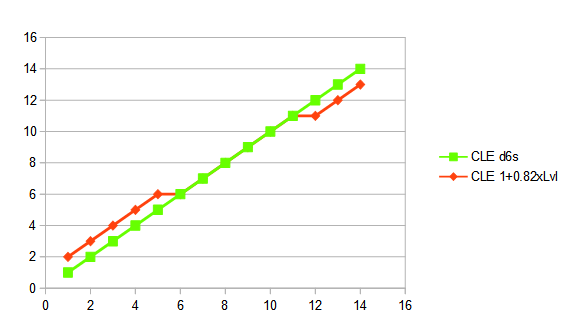 So, ignoring Climb for a moment, we choose a 17 as our target number at 1st level, increasing by one each level. In other words, to succeed at a Thief skill, you must roll d20 + Thief level for a result of 18 or higher. Hell, why not call it a nice round easy-to-remember 15, and give Thieves a little boost? 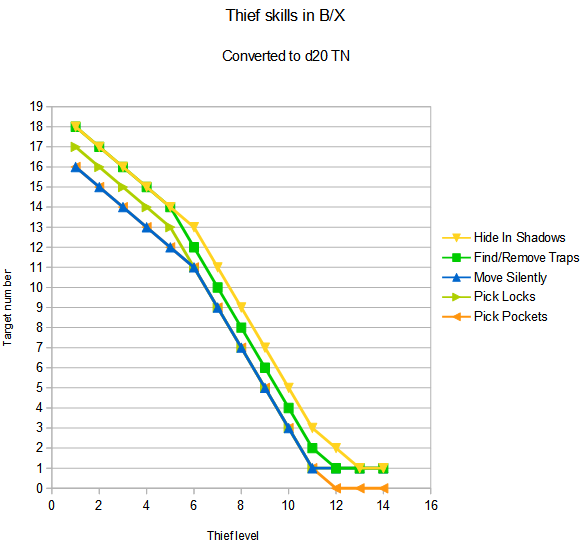 The B/X Thief is commonly seen as too inefficient, and in fact AD&D boosts many of the thieving chances by 10%. Now, doing this does improve all characters’ odds from the default 16.6% of LotFP to 30%. But, especially these days, most OSR play takes place in the low levels. I’m okay with letting characters do a bit more. (For comparison, the Mutants & Magic proposal linked above lets 1st-level Thieves succeed on most things on a 12-14+.) 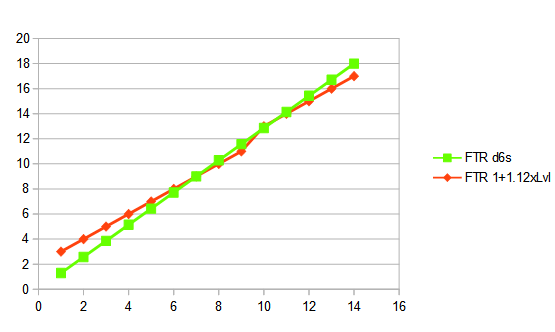 Incidentally, choosing 15 as the target number, the new chances start to fall behind the B/X Thief's at 8th-9th level. "Most LotFP campaigns feature lower level characters, and modern campaigns do not last long enough to build characters to higher levels. ... providing characters more possibilities at lower level and decreasing the importance of gaining levels is important." Finally, let’s get suspiciously modern and use the term “proficiency” for adding Thief levels to the roll. Thieves shall have proficiency in Stealth, Climb, and Tinker. If we take a leaf from LotFP’s increasing demihuman skills, then Dwarves would have proficiency with Architecture, Elves with Search, and Halflings with Bushcraft (and also have a +10 to hide in the wilderness). I would also probably give Fighters proficiency in Open Doors, because why not? They’re likely to be the most physical type. All activities and skills (Climbing Sheer Walls, Finding Traps, Removing Traps, Hearing Noise, Hiding in Shadows, Moving Silently, Opening Locks, Picking Pockets, Forcing Open Doors) are rolled on a d20. The appropriate ability modifier is added, as well as Thief level if the activity is thiefy. A result of 15+ is a success. Now that all Thief activities progress the same, you can combine those that use the same ability, i.e. Stealth and Sleight of Hand. If you see Tinker (Pick/Remove Traps) as an activity requiring more dexterity than intelligence, then that can be merged in too for a general "Thievery" skill. As an extension of the system, you could have character backgrounds that give you background skills granting a +2 bonus to certain activities. So what’s the score? We have made abilities slightly more important, which depending on your taste may be a good thing or a bad thing (but actually less important compared to roll-under ability checks). We now have a Thief and not a Specialist - we’ve removed “builds”, option paralysis, customization - which again you may see as either good or bad. We've made Thieves decent at everything, but far worse at climbing (I dunno, give them a +10 to climb or something if you want). As a positive, we’ve reduced the space taken up by skills on the character sheet, since you no longer need to list the individual skill levels, only whether you’re proficient in them - adding your level to the roll is easy enough. And there's no need to print a Thief skills table in the rulebook anymore. However, I see some serious risks in going in this direction. Those risks are psychological shifts that may happen in dungeon masters when moving from a “X in Y” chance to a target number which has treacherous resemblance to the modern “d20 + proficiency vs. difficulty class” mechanic of 5e. The danger is that DMs will start to see the fixed target number of 15 as a "default DC" that they will begin to carelessly modify. They may be tempted to do this where they would not have been in a d6 skill system. LotFP's rules only mention modification of the chances in two places: opening giant stone doors, and attempting to forage in different terrains such as the desert. Modifying the target numbers too often may give rise to a treadmill where characters get more competent but DMs constantly raise the obstacles in response. Because... for some reason a locked chest in a high-level dungeon would have a higher DC to open? I am generally against that, and it should be used very sparingly, as LotFP does. Just let players know their chances of success, and let characters feel competent! This psychological risk of treadmills could perhaps be mitigated by pre-applying the modifiers and listing the naked die result required on the character sheet, as saving throws are handled, though that would take up a bit more space on the sheet and require updating every level. The other risk is that it will tempt DMs to call for knowledge rolls, and perception rolls. Those are harmful too, but the explanation why is a subject for another blog. Finally, I'd like to say that I'm not under the impression any of this is an original idea. The Thief seems to be one of those topics of eternal discussion. In fact I'm almost certain there are already several blogposts with same idea, but Google failed to find me any so I'm barfing my notes on here. A contest on G+ to come up with a new way to speed up combat in D&D caught my interest, two responses in particular. The first was Cavegirl’s one roll fights. It reminds me of the War Machine mechanic from Rules Cyclopedia, and really drives home the idea that battle is a risky proposition that you should not undertake without heavily stacking the odds first. Personally, if I were to hack it, I might turn it into two rolls instead. Players could see the result of the first roll, and then get a chance to affect their fates with spells and such, or simply run away. Then, winning two rolls would mean an overwhelming victory, winning only one roll a victory at a cost, and losing both rolls an escape-or-die situation. The second interesting idea in the thread was replacing HP with HD, that is, you can take a number of hits equal to your number of hit dice. One hit from any weapon is... one hit. There would be no damage rolls, which certainly should speed up the game and reduce calculations and bookkeeping... I couldn’t stop thinking about this idea. So I grabbed my trusty spreadsheets and tried to hash it out in detail. Note that this is not playtested yet, just theorycrafting so far. I would quite like to playtest this at some point if I can iron out some of the issues, but that may require additional hacking of ability scores. First, let’s look at how many hits a PC can take under current rules (using the gold standard of B/X). On average, a 1st level Fighter, having d8 HP can take 1.29 hits from a d6 weapon before going down. Magic-Users can take 0.71 hits, and clerics 1 hit. These averages increase linearly by level. Here’s how many d6 hits a B/X character can take on average under the default rules, rounded up. So that is the rough guide we should look at when designing this new damage-roll-less system, in order to approximate the same level of PC survivability. Throughout this article, I will refer to these new survivability points as Health, to avoid confusion with the normal Hit Points. Instead of damage, attacks will deal Wounds. Taking one Wound is the same as losing one Health. A d6 of old HP damage translates to one Wound in the new system. So why are we looking at d6 damage? d8 damage, after all, is quite common for a one-handed weapon of war - there’s not much reason for a Fighter to use a handaxe instead of a battleaxe. But remember that variable weapon damage is an optional rule in B/X. We are looking at the d6 because that’s how much damage all weapons originally did. As for monster damage, looking quickly through the list, the d6 seems to be most common die, although there are a lot of d8s (and “as weapon”) too. We are faced with a choice of two options for this new system. Either we base player Health off the d6, which is in line with non-variable weapon damage. This makes monsters die more easily (29% more), since we’re pretending they used a d6 hit die before when in actuality it was a d8 (well, at least after variable weapon damage was introduced - before that it was a d6). The other option is to base everything off the d8, which makes everyone about equal in relation to B/X, but greatly boosts d4 weapons and smaller. Perhaps we should err in favour of the players here. So, we have all weapons dealing 1 Wound on a hit, and monsters having Health equal to number of HD. The straightforward way to work out player health would be to use that d6 table above straight. Essentially, players would have 1 Health per d6 (3.5) hit points, rounded up. Fighters would start with 2 Health, while Clerics and Magic-Users would start with 1 Health. However, looking at only averages results in a very poor fit for low levels. While it works out to the same results on a high number of repetitions, at low levels repetitions are low and you’re cheating players out of a lot of chances to survive. For example, when taking a hit from a d6 weapon, a 1st level cleric (d6 HP) has a 42% chance of surviving. Even a Magic-User has a 25% chance of surviving, while the Fighter has 56%. Generally, you have slightly worse than even odds to survive a weapon with a damage die equal to your hit die at 1st level (because a tied roll still brings you to zero). See the chart below. "It meant that players had a chance to live longer and do more. ... They didn't care if they could kill a monster in one blow, but they didn't want the monster to kill them in one blow." The simplest solution to the “level 1 problem” would be to have all classes start at their Health values of level 2. They would then not gain an additional Health at 2nd level, but follow the progression according to the above table thereon. However, since we will have to make a whole new Health table anyway, this is a good opportunity to tweak the progression. We can use an entirely new equation, unshackled from the idea of one die size and one die per level. This way, we know where our numbers are coming from, and we’re not just blindly reimplementing artifacts that arose from the restrictions of the original system (i.e. the shapes of dice that were available to the original designers) while compounding them with new restrictions. And gaining 2nd level is the first time players get to experience leveling up, so it should feel like something! 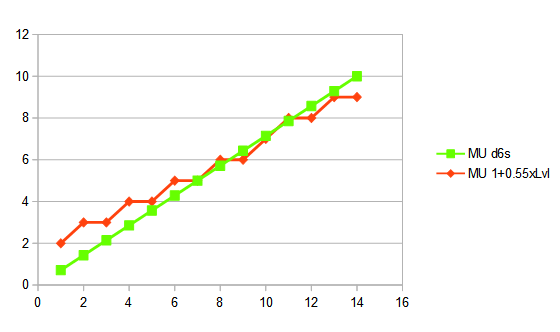 So, here’s an alternate progression you can use, based on a linear factor multiplied by level. Health = 1+YxLvl, rounded up. Y factor: M-Us 0.55, Clerics 0.82, Fighters 1.12. These progressions follow the original progressions the closest at mid-levels. They start out better at low levels, and fall off at high levels. I think it looks quite good. A bit more survivability at low levels is not a terrible thing, in my opinion. Some interesting artifacts: Magic-Users do not gain any Health on levels 3, 5, 7 and 9, when they gain powerful new spell levels. Between levels 5 and 6, which is when Clerics suddenly gain two new spell levels in B/X (though not in Labyrinth Lord), they do not gain any Health. There is also a remarkable resemblance to the hit dice progression from the OD&D (before the Greyhawk supplement), where every class (and monstes) had a d6 hit die but gained them at different rates - Fighting-Men gained a die per level, Clerics gained one on almost every level, and Magic-Users gained one every other level. Now that we have our Health progression, we simply need to modify by Constitution. We can say that each +4 HP from Constitution (round up) is about equivalent to one additional hit die (and, consequently, Health). Thus, a +1 modifier should grant an additional Health every 4 levels, a +2 grants an additional Health every two levels, and so on. A +2 modifier should grant an additional Health every two out of three levels. This means that for a max level Cleric the gain from Constitution is actually slightly lower than the original HP system (1.77x vs. 1.86x). Once again, this formula improves things for players at low levels but makes it slightly tougher at high levels. The downside is that on each level up, players will have to reference both their class’s Health chart and the Constitution Health adjustment chart and sum the values. Then, because they progress at different rates, it is actually possible for them to lose Health on level up with a -1 or -2 modifier. That's obviously a huge flaw in these steps. So there needs to be some stipulation that your maximum Health can never decrease on level up. It gets rather messy and inelegant. Constitution is the biggest obstacle I currently see to the new system. All this gives me half a mind to just get rid of the -3/+3 modifier range and have them go from -2/+2. Abilities shouldn’t matter overmuch, after all. Alternatively, one could have reduced Health gains from Constitution (and penalties which never overtake Health progression) and make Constitution important for other things, like dying/bleeding out. Monsters will have one Health per HD. Thus a PC hitting a goblin or skeleton always kills it, no damage roll required. Functionally, this makes them similar to the famous Minions from 4th edition. Monsters with a plus on their HD will be treated as one HD higher for purposes of Health. 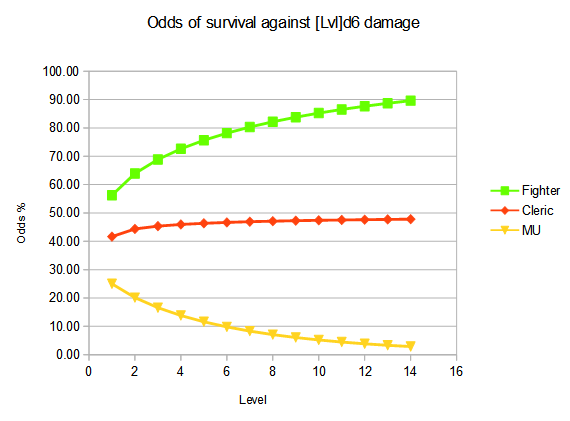 All sources of damage do one Wound for each damage die (d4 to d12). Each +4 counts as one additional die. For example, a trap that does 4+2d4 damage will deal three Wounds, and an attack that does 1d10+1 damage will deal one Wound. Spells which do half damage on a successful save will only do half Wounds. For example, a fireball spell has 8 damage dice so it will do 8 Wounds on a failed save, or 4 Wounds on a successful save. The one exception is when halving the damage dice (e.g. due to resistances) would leave half a damage die, or when an attack would deal damage in an odd number of d3s. These are called “half-dice”. A half-die will have a 50% chance of doing no Wounds and a 50% of doing one Wound. For example, an attack that dealt 3d3 damage will now deal one Wound, and have a 50% chance of dealing a second Wound. Or, you hit a creature with a torch for 1d4 fire damage, which would usually be 1 Wound, but if the creature is resistant to fire, you only have 50% odds of dealing a Wound on a successful hit. On-hit effects are still applied regardless of damage. For example, a ghoul’s claw is d3+paralysis, so the paralysis is applied on every hit, even though damage is only applied 50% of the time. (Also, to prevent everyone just using torches as weapons instead of swords, you may want to give them a reduced damage chance too, or say they’re only an effective weapon vs. specific enemies such as trolls and mummies). What about two-handed weapons? Differentiating them will be dealt entirely with Fighter abilities. When using shields, Fighters can sunder them to negate damage. When using two-handed melee weapons, Fighters can attack again each time they score a kill. Greatweapons might also be allowed to overcome the slashing/piercing resistance of skeletons due to their large mass. Additionally, Fighters will deal an additional Wound on a natural 20. All this leaves crossbows in a somewhat strange position - they shoot more slowly but deal the same damage as everything else. I may reinstate the armor piercing from LotFP there. Crossbows will fire every other round and pierce 2 AC for light crossbows or 4 AC heavy crossbows. Unarmed fighting: If an attack roll with an unarmed strike succeeds, players need to roll to see if it deals a Wound. Since unarmed strikes had a d2 damage die before, their odds of dealing a Wound are now 2 in 6, plus 1 in 6 for each point of Strength modifier. Perceptive players will notice that this is the same chance as Open Doors rolls in B/X - perhaps we can rename Open Doors to “Smash” and use it for both. We could even use this chance for improvised weapons (e.g. torches) and treat them the same as unarmed strikes. Health will replace HP. Player characters gain Health according to new class tables. Monsters will have one Health per HD, plus one Health if they have any pluses on their HD. Damage is not rolled, instead damage sources will deal one Wound per die of damage, plus one Wound for every 4 fixed damage. d3 damage sources and odd dice halved due to resistance will have a 3-in-6 chance of dealing one Wound. Open Doors chance equals the chance to deal damage on a hit using an unarmed strike or improvised weapon. Effects that refer to the target’s Hit Dice (such as Sleep) will use levels instead when the target is a PC. Less tracking/HP maths on the fly - Health values are in the single digits for most of the game. Fewer dice required (players only need d20 and d6). Doesn’t break compatibility with existing material. Smaller design space for abilities. Some players may find less rolling less fun. Things become more static and predictable. It’s easier for players to tell when they should retreat. Players usually want to retreat when they have 1 HP, but feel like they have a decent chance at 4 HP. Applying Constitution modifiers becomes more complex.